Although being released on DVD as part of Optimum's Boulting Brothers Collection, brother John doesn't get a look in here, as the 1956 Run for the Sun is a Roy-only affair, a rare trip across the Atlantic to work for an American studio in the period between the Boultings' auspicious early thrillers (Brighton Rock, Seven Days to Noon) and the social comedies of mid to late 50s and early 60s. 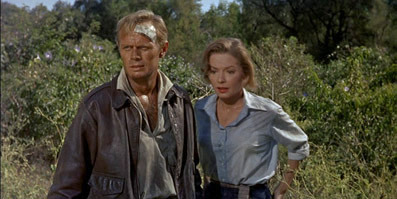 The film is structured in three distinctive acts, the first of which lands well-dressed and everso slightly out-of-place Katie Connors (Jane Greer) in the Mexican coastal town of San Marcos, apparently in search of fellow American Mike Connors (Richard Widmark), who on meeting she pretends not to recognise. Connors, it soon turns out, is a famous author who has disappeared from the literary scene and has found a happy hideout as a fisherman in a community that has taken Signor Miguel to its heart. Inevitably the two are introduced and over the course of the following week they become friends, but not once does Mike give serious thought to why this city girl has gone to so much trouble to hunt him out. The audience is clued in when she takes a phone call from New York and it's revealed that she's a reporter for Sight magazine, her latest assignment being to track down and write a story about Mr. Connors. Only she's starting to have doubts about the whole thing, doubts that are confirmed when Mike reveals that he's not as happy as he seems, and has spent the past five years trying unsuccessfully to recapture a talent that appears to have deserted him. Act 2 kicks off when Katie decides to abandon her mission and head for home, only to be convinced by Mike that her planned road journey to Acapulco is close to impossible and that she should let him fly her there instead, a fine idea that goes a little awry when their compass malfunctions and an empty fuel tank crash-lands them in the jungle. They are rescued by an Englishman named Browne (Trevor Howard), who is holed up in an isolated encampment with Dutch archaeologist Van Anders (Peter van Eyck), whose workforce of impoverished locals are kept in order by a pack of angry dogs. Yes, there's something not quite right about these two gentlemen. Mike quickly smells a rodent of some description, a suspicion fuelled by the disappearance of his plane and his conviction that he and Browne have met somewhere before. The development of this story strand is what gets us to act 3 and the portion of the film that is most recognisably based on the film's source novel, Richard Connell's The Most Dangerous Game. Even here the film makes its own deviations, with Browne and Van Anders' hound-assisted pursuit of Mike and Katie driven by the need to prevent their escape rather than sporting amusement. Just what sparks this life-and-death chase is not for me to say, although a quick look at most published synopses will clue you in if you really want to know, and none of it would count as a serious spoiler. Run for the Sun is an adventure story of the old school, one that can afford to spend a third of the film building the characters and another third on intrigue and suspense before getting down to the action. From a modern perspective it remains entertaining rather than compelling, in part because the characters, though most engagingly performed, tend to fit the ready-to-wear genre suits: Mike has dropped out from society and is wrestling with personal demons, but is just bound to come through as a man of action when the time is right; Katie is a go-getting career woman who discovers that she's willing to put ambition on hold when she meets the right man, whom she inevitably has to rely on when the going gets tough; and the bad guys are, well, let's just say they've been carefully selected to ensure that audience sympathy is minimal at best. 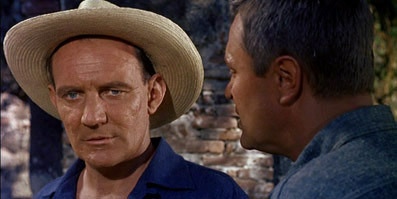 A solid and workmanlike job, Run for the Sun lacks the quirky character detail and smart dialogue that distinguishes the Boulting's best work, though the Boulting skill with monologues is visible in a nicely written scene in which Mike profiles Browne as a character from his next novel. There's also a cinematic efficiency to much of the storytelling that allows Boulting the director to establish Mike's profession and situation with a single brief glimpse of a magazine cover, and reduce a week's worth of friendship building between him and Kate to two lines of dialogue and a single economical edit. And while the well worn tradition of showing in the first act the weapon you're going to use in the last is followed to the letter, it plays out in a manner that is inventive enough to forgive any trace of dues ex machina. As with recent Optimum DVDs of Robbery and the Boulting brothers' Suspect, the transfer is the work of Optimum's European arm, Studio Canal, and in common with these discs the original framing has been cropped at the sides, but this one's easily the oddest of the lot. Shot, as the opening credits announce, in something called Superscope 235, which was one of the many short-lived offshoots of Cinemascope, the original aspect ratio was 2.35:1 (hence the name) but has here been cropped to a most unusual 2:1. Maybe Vittorio Storaro was in charge of the transfer. The good news is that the picture quality is first rate, boasting consistently fine sharpness, colour and contrast and almost completely free of dust and damage. It's also anamorphically enhanced, as you'd expect. The Dolby 2.0 mono soundtrack is clean, clear and noise-free, though with the expected restrictions in dynamic range. Not on this disc, matey. A solid, entertaining old school adventure that lacks that certain something to make it a standout of its type. A not exactly typical work from the man who the same year co-created Private's Progress, it's still an interesting inclusion in Optimum's Boulting Brothers Collection, but I'm still a bit mystified by that aspect ratio crop.